The company is primarily engaged in the exporting, importing, and supplying of Hydrogen Peroxide (50%) all across the globe. 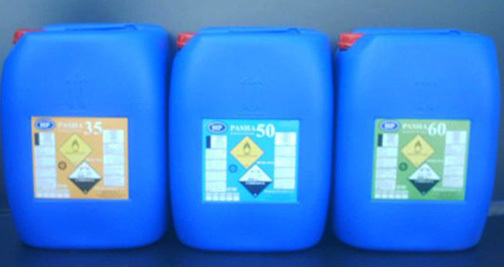 The Hydrogen Peroxide, which we offer, is used in various domestic and industrial purposes. The Hydrogen Peroxide can be availed from us at affordable prices. A small spray bottle full of hydrogen peroxide can be kept in the shower to be used as a disinfectant and used after each use. In addition, this can be done for toilets and bathroom sinks when people have colds or other contagious diseases. Two oz. put in the dishwasher to prevent spreading of colds or other diseases. Hydrogen peroxide is great for adding to plant water to provide them extra oxygen. This is good because tap water has lost much of its oxygen after being passed through pipes for such a long, long time. This is also good for cleansing fruits and vegetables. Just put some salt and 1/4 cup of hydrogen peroxide into a sink full of cool water and use to rinse the food with. There is one company that has used hydrogen peroxide as a sterilizer to use in hospitals including patient rooms, surgical and other medical equipment, and even to safely and effectively sterilize ambulances. This is a major breakthrough because previously it was nearly impossible to sterilize the inside of an ambulance. With this procedure they make sure the outside of the ambulance is tightly closed and use hydrogen peroxide in a vapor form to sterilize the inside. When finished the ambulance is opened and dried. The hydrogen peroxide separates into water and vapor all by itself. There is very little wiping needed. Previously there was a necessity to wipe down every item and every compartment inside the vehicle and this took a long, long time. It is again important to note that all of these procedures are done with only the 3% solution. Several very good medical uses are infections (usually in the skin and mouth), cold sores, mosquito and other insect bites, and pimples. For most of these minor problems, all one has to do is either pour a small amount from the cap, use a small tissue, or even just put on your finger and rub it on. Minor infections and cold sores disappear quickly. Putting some in the ears helps breakdown excess earwax and prevents or gets rid of ear infections. For colds, put a VERY small amount of hydrogen peroxide and fill the rest of the cap with water and while holding one nostril closed, breathe it into the other nostril. It will go down up the nose and down the back of your throat, blow your nose immediately. Do this once or twice a day as needed until the cold goes away. However, if it burns too much dilute it more or do a quick follow up with a capful of plain water (no hydrogen peroxide). Concentration (± 0.5) %w/w 50 min. Acidity (as H2so4) g/100ml 0.06 max. Stability (mlo2/min./25ml) ml./min. 0.3 max.